During outbursts, the infant star illuminating the McNeil Nebula may brighten by 100 times at X-ray energies. In this rendering, magnetic fields drive powerful flows onto the star, creating two hot spots that produce the high-energy emission. X-ray observations have revealed something curious about the young star that illuminates McNeil’s Nebula, a glowing jewel of cosmic dust in the Orion constellation: The object is a protostar rotating once a day, or 30 times faster than the sun. The stellar baby also has distinct birthmarks—two X-ray-emitting spots, where gas flows from a surrounding disk, fueling the infant star. The young star, V1647 Orionis, first made news in early 2004, when it erupted and lit up McNeil’s Nebula, located 1,300 light years away in a region of active star formation within the constellation of Orion. The initial outburst died down in early 2006, but then V1647 Ori erupted again in 2008, and has since remained bright. More recently, astronomers combined 11 observations of V1647 Ori from NASA’s Chandra X-ray Observatory, the Japan-led Suzaku satellite, and the European Space Agency’s XMM-Newton to determine the source of the high-energy emission. The team began monitoring the star shortly after its eruption in 2004 and continued to keep watch through 2010, a period covering both eruptions. Strong similarities among X-ray light curves captured over this six-year period allowed the lead author on the study, Kenji Hamaguchi, astrophysicist at NASA’s Goddard Space Flight Center, to identify cyclic X-ray variations. Hamaguchi and the rest of the team determined the star is rotating once per day, making V1647 among the youngest stars whose spin has been determined using an X-ray-based technique. Results from the study will appear in the paper “X-raying the Beating Heart of a Newborn Star: Rotational Modulation of High-energy Radiation from V1647 Ori,” in the July 20 issue of The Astrophysical Journal. 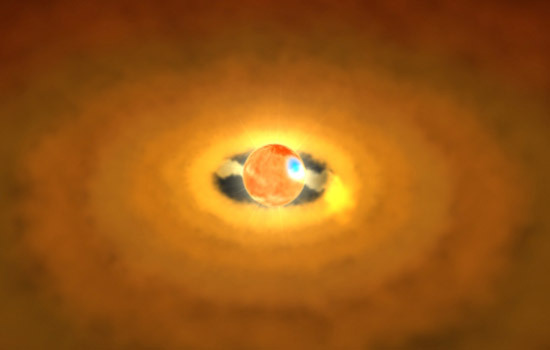 The team identified V1647 Ori as a protostar in formation. “Based on infrared studies, we suspect that this protostar is no more than a million years old, and probably much younger,” Hamaguchi says. V1647 Ori presently feeds on gas channeled from a surrounding disk and will likely continue to do so—though not nearly so rapidly—for millions of years. At that point it will finally be able to generate its own energy by fusing hydrogen into helium in its core like the sun and other mature stars. Hamaguchi’s analysis focused on repetitive behavior found in the data from all three of the X-ray observatories. By combining data, he pieced together a picture showing the daily rotation of two X-ray-emitting spots on V1647 Ori that are thousands of times hotter than the rest of the star. The hot spots are located at opposite sides of the star, with the southerly one five times brighter than its companion. Each spot is about the diameter of the sun. In comparison, the low density of V1647 Ori bloats the star itself to nearly five times the size of the sun. “One attractive possibility for driving such high-speed matter involves magnetic fields that are undergoing a continual cycle of shearing and reconnection in mass accretion,” says co-author David Weintraub, professor of astronomy at Vanderbilt University. In this picture, X-ray outbursts result from interplay of the magnetic fields belonging to the star and the disk. The star spins faster than the disk and winds up the magnetic fields until they snap like rubber bands. The pent up energy creates a powerful blast when the tangled magnetic fields fall back into place. The process, called magnetic reconnection, also powers X-ray flares on the sun. During the outbursts, the star’s luminosity varied at optical and infrared wavelengths. The astronomers associated this to changes in the protostar’s main energy source, the inflow of matter onto the star. Because changes in the X-ray brightness of V1647 Ori closely followed those in the optical and infrared, the team established that its higher-energy emission is also closely linked to accretion. 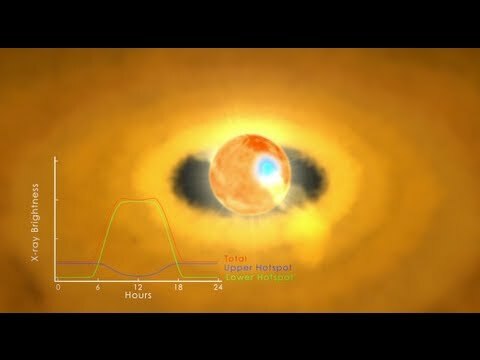 “V1647 Ori gave us the first direct evidence that a protostar surges in X-ray activity as its rate of mass accretion rises,” says co-author Nicolas Grosso, an astrophysicist of the French National Center for Scientific Research at the Strasbourg Astronomical Observatory. The finding that an accretion burst could be accompanied a surge of high-energy X-rays during the formation of a young star was originally announced by essentially the same study team, led by Kastner, in a paper published in Nature in 2004. In that paper, the team first argued that X-rays emitted by V1647 Ori were coming from material falling onto the star from a surrounding disk. Up until then, the more widely accepted mechanism for producing X-rays from protostars was thought to be via coronae that are far more powerful than the sun’s, Kastner explains. Signatures in X-ray observations of a handful of stars in formative stages had led to the hunch that accretion might also contribute to or even dominate protostellar X-ray emission. The eruptions of V1647 Ori and a few other young stars that were accompanied by elevated X-ray emission levels have since underscored this connection, Kastner notes. “The exciting and unexpected thing about our fresh look at the whole set of X-ray data for V1647 Ori is that this is the first time we’ve seen a star in such an early stage of formation with a regular rotation that you can measure in X-rays,” Kastner says. Kastner and team hope to confirm the X-ray study’s findings at infrared wavelengths using NASA’s Spitzer Space Telescope. Additional co-authors on the study include Michael Richmond, professor of physics at RIT; David Principe, a doctoral candidate in RIT’s Astrophysical Sciences and Technology program; and William Teets, a recent doctoral recipient in physics and astronomy from Vanderbilt University.